“We’re the gold standard,” Cate Blanchett’s Mary Mapes insists midway through Truth, a detail-oriented look at the 60 Minutes Killian documents controversy in 2004. It’s nowhere near as polished or compelling as James Vanderbilt’s script for Zodiac–then again, not much is–but it’s driven by some solid performances and an interesting real-life story. Cate Blanchett in particular is a fiery presence here, her character having to deal with the mounting pressure from all sides as she watches her story crumble. Even when the material isn’t quite so strong, Blanchett has a good handle on what’s needed for her character. So does Robert Redford, and he finds the nuance needed to play Rather as the film depicts a paternal relationship with Mapes. It’s well played by the two experienced actors, and it does result in some poignant moments for the pair as more and more holes are poked in their story. What doesn’t work very well, however, are Vanderbilt’s attempts to connect this all to Mapes’s abusive father; it’s designed to flesh out the character, but it winds up being an overstated point during several scenes near the end. And by that end, it’s clear who we’re supposed to side with and what message we’re supposed to get. 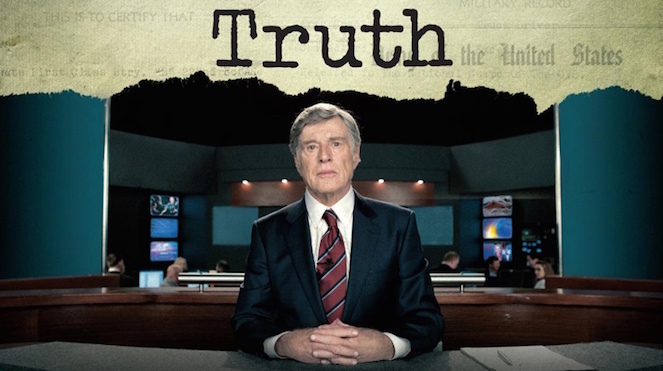 The movie laments the degeneration of old school journalism, of news crews not controlled by corporate and political interests. The way the point’s made is by no means subtle, but it’s effective watching these characters attempt to navigate the broken system around them. They by no means did everything right, the movie argues, but they were still wronged. -The movie’s stuck in a middle ground in terms of scope. It tries to combine grand, sweeping statements and themes with a more intimate look at the team, but it could be better served by picking the latter. I enjoyed this film too!! Saw it on Wednesday with a Prod, Q & A after.. I thought Cate was just amazing in it..and Redford so simply good!!! Total liberal garbage. It’s funny cuz Zodiac was based on the notorious liar Graysmith. The guy who did this movie must love liars.